Solar Water Heating installation offers continuous year long supply of free hot water (or preheated hot water) used for space heating or domestic hot water production. For these two applications, Canadian Standard Association CSA-F379 code dictates various health and safety measures that insure the safety of the end users as well as the property where solar water heating system is installed. This blog will discuss the most important safety measures along with some code requirements (what is allowed and what is not etc...). The specified heat-transfer fluid shall be potable water or relatively harmless liquid. A backflow preventer that meets the requirements of the CAN/CSA-B64 Series shall be supplied for installation between the potable water distribution system and the inlet to the SDHW system. For closed-loop systems, a pressure gauge with the maximum safe working pressure clearly marked shall be supplied and installed on the heat-transfer-loop piping. For closed-loop systems, a pressure-relief valve with an opening pressure less than the normal minimum operating pressure of the potable water system at the heat exchanger shall be installed on the heat-transfer-loop piping. For closed-loop systems that do not use water as the heat-transfer fluid, the total volume of the heat-transfer fluid in the closed loop shall be less than 10% of the manufacturer’s required minimum volume of potable water storage. The total volume of the heat-transfer fluid shall be determined for the longest piping run specified by the system manufacturer. A backflow preventer shall be installed on the domestic cold water supply line, as indicated on the left diagram. 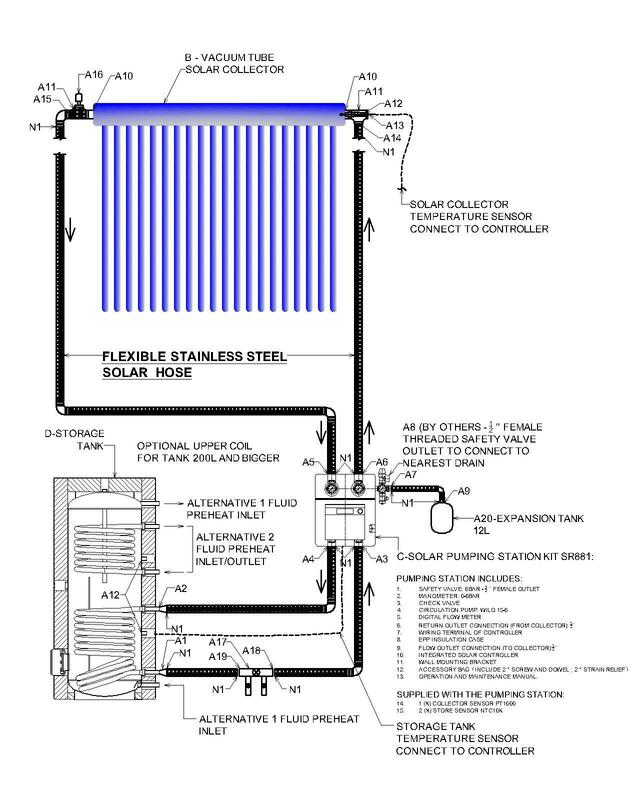 The purpose of this requirement is to eliminate the risk of contaminating domestic cold water network when solar water heater immersed coil leaks Propylene Glycol inside the tank. The selection of Backflow preventer shall be according to risk evaluated as per Canadian Standard CSA-B64. Another important safety measure is that the Volume of Fluid heat transfer (Propylene Glcyol in pressurised closed loop system) shall never exceeds 10% of Thermal Storage Tank Volume. So for a solar heating kit with 300 L tank volume, Propylene Glycol present in the closed pressurised loop shall not be more than 30 Litres. The double-wall heat exchanger shall have a visible means of leak detection. The wall materials shall be chemically compatible with the heat-transfer fluids with which they are in contact. The heat-transfer fluid shall have a Hodge and Sterner scale toxicity rating of 5 or higher. A pressure gauge with the maximum working pressure clearly marked shall be supplied and installed on the heat-transfer-loop piping unless the heat-transfer loop is designed to be open to atmospheric pressure. Each solar water-heating system shall be provided with pressure- and temperature-relief devices designed and located to prevent rupture of the system due to buildup of excessive internal temperatures or pressures. Such relief devices shall operate without the use of auxiliary power. No rupture or permanent damage shall occur and the manner of any discharge of liquid from temperature- and pressure-relief devices shall be such that there is no danger to the user nor damage to the environment. As show in the above schematic diagram of our solar water heating Kits, the pressure and temperature relief valve is usually installed on the solar pumping station between pump and expansion tank. Located and maintained on or within the tank so that the maximum temperature of the water in the tank does not exceed 99 °C under any operating conditions. Solar domestic hot water storage tanks equipped as specified in this Clause shall bear the information that they are so equipped in a clearly visible location. A pressure-relief valve and a temperature-relief valve may be combined to provide compliance with this Clause. Article 7.3.1 of CSA-F379 requires that when water temperature within tank exceeds 49°C, a means of scald protection and scald protection labeling shall be provided. CAUTION: SINGLE-WALL HEAT EXCHANGER — FILL ONLY WITH MANUFACTURER-RECOMMENDED HEAT-TRANSFER LIQUID. NEVER FILL WITH TOXIC LIQUID*. 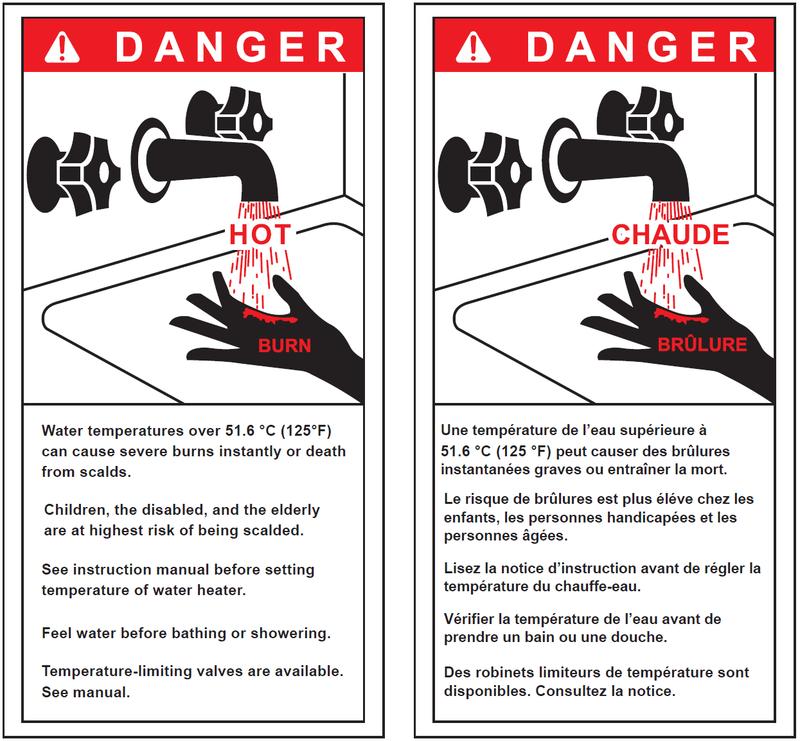 *The equivalent French wording is: ATTENTION : ÉCHANGEUR DE CHALEUR À PAROI SIMPLE — REMPLIR UNIQUEMENT AU MOYEN DU LIQUIDE CALOPORTEUR RECOMMANDÉ PAR LE FABRICANT. NE JAMAIS UTILISER UN LIQUIDE TOXIQUE. DOUBLE-WALL HEAT EXCHANGER: FILL ONLY WITH MANUFACTURER-RECOMMENDED HEAT-TRANSFER LIQUIDS*. *The equivalent French wording is: ÉCHANGEUR DE CHALEUR À DOUBLE PAROI — REMPLIR UNIQUEMENT AU MOYEN DES LIQUIDES CALOPORTEURS RECOMMANDÉS PAR LE FABRICANT. 50 °C above the temperature used for testing the collector absorber. The above safety measures do not represent the all code safety requirements. It's the responsibility of Solar Water Heating System Designer and Installer to comply with applicable codes and standards (Whether Federal, Provincial or municipal).